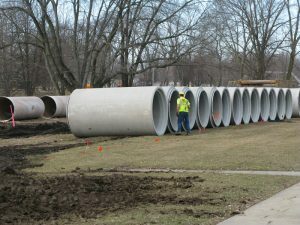 Across the country, municipalities are facing incredibly high costs to reduce their combined sewer overflows (CSOs) and sanitary sewer overflows (SSOs). We provide a wide range of services to assist clients with CSO and SSO compliance, such as consent decree negotiation, regulatory and programmatic support service, long-term control plan development, TMDL analysis, regional planning, system-wide modeling, and detailed design. In providing these services, we are very conscious of the financial burden that CSO/SSO compliance can put on the rate payers in the community. We work to provide cost saving solutions and to maximize the return on investment that the community ultimately realizes. We are nationally recognized for developing sustainable CSO controls. We focus on solutions that are cost effective and feasible, integrate with proposed gray controls, encourage community partnerships and benefits, maximize the role of green in CSO control, and represent a cohesive regional or watershed-based plan. Our proposed solutions are also rooted in a “business case” evaluation that enable the client to compare costs and benefits of suggested solutions with more traditional control techniques. Proposed solutions often involve multiple elements and typically represent a mix of traditional gray engineering and “green infrastructure” solutions. Contact us for more information about our CSO/SSO Abatement Services.